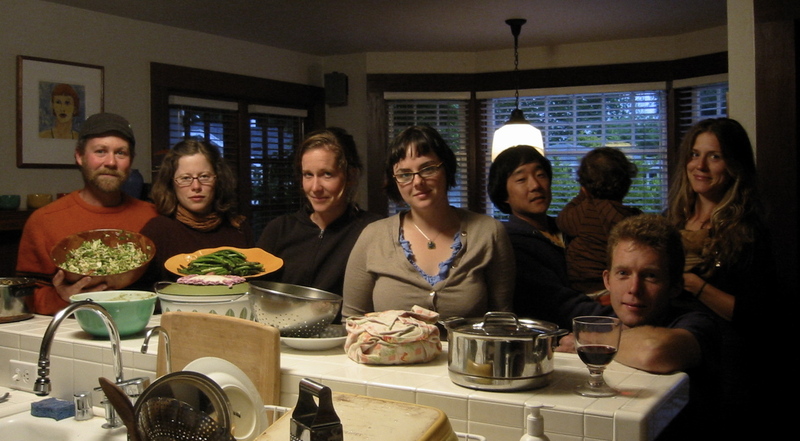 Josh, Ann, Emilyn, Tiffany, Jeff, Seiji, Quentin, Holly When I arrived in Santa Cruz I came home to an empty house. My folks are in Missoula visiting my sister and are not due back until Wednesday. So, in classic kid tradition, I invited my friends over to "party" in the parent's house. Of course, partying doesn't mean what it used to. No strip poker, no random make-outs, no barfing. Partying now means food and lots of it. We truly feasted. But primarily we feasted on each other's company. I have known this group for many many years. And yes, you could say we are a modern family with our fair share of emotional entanglement. But it is this shared history that makes where we are now and where we are going that much more rich. When I am asked what to do and see when visiting Santa Cruz, I don't know what to say. What is lovely about this town is not the beach, the restaurants, the sun, it is them, they are lovely. They are why I keep coming back, keep looking back, keep Santa Cruz close to my heart. My dearest ones.